Every software guy requires certain data structures to store a particular type of data. Every programming language of today provides Arrays as fixed sized and easy to use data structure, but as we develop applications we requires more advanced abstractions like stack, queue, list, map...etc. Although Java Collections provides an in-build support to use these data structures on the fly, but as a programmer we must know actual implementation of these things. 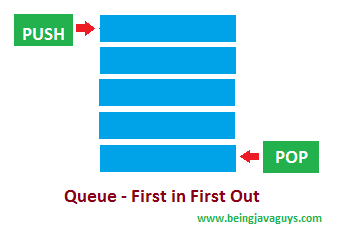 In this particular blog we will discuss how to implement queue in Java using Array. Queue is a commonly used and efficient data structure with a first in first out capability. Lets see how to implement Queue push and pop operations in java using Array. 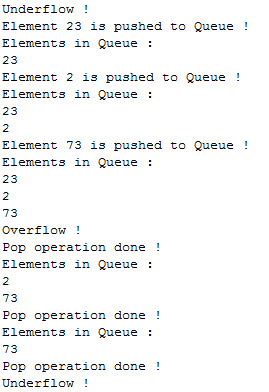 This is a sample program to demonstrate push and pop functionality in Queue in Java. If everything goes right you will see following output on console demonstrating all possible cases in Queue Implementation. In this particular blog we came across 'Queue Implementation in Java using Array '. In upcoming blogs we will see more about general purpose data structures implementations in Java and other open source Technologies.